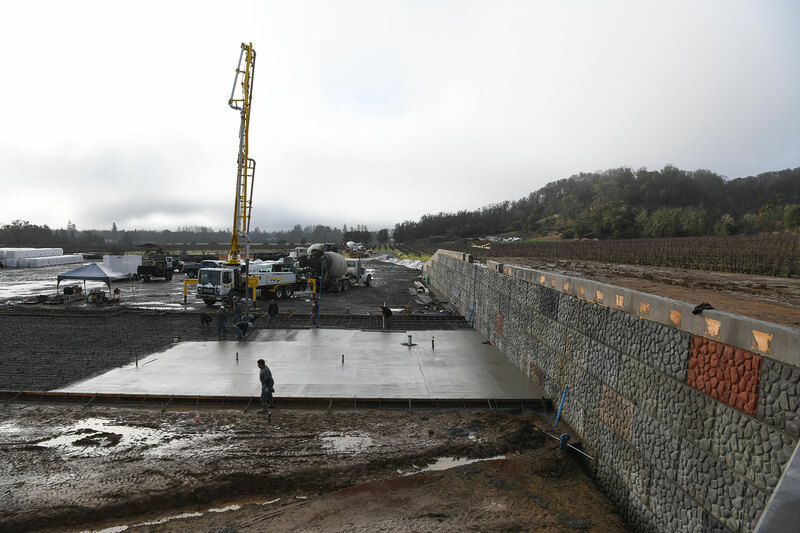 We are excited to be building our new winery on West Road in Redwood Valley. Our new site is located amongst vineyards that we have farmed for many years, but we rarely had the opportunity to show off the beauty of the land to visitors. It is a south-facing parcel that is tucked up against forested benchland and is home to a few majestic valley oaks and a scenic irrigation pond. We knew that for the design and construction of the building we would need a team leader who was aligned with our vision for an energy-efficient and sustainable space. Craig Frost of Frostline Systems, based in nearby Willits, was the perfect person to head up the design and build. Craig has experience in mechanical engineering, architecture, and construction and has been involved in the remodeling of the Cotton Auditorium in Fort Bragg, the construction of Laytonville High School and low-income housing in Mendocino County. The outer shell of our new winery is a 43,000 sq ft metal building that measures 37 ft tall and supports a roof of solar panels. This is the first time in our winery’s history that the majority of our wine tanks will be housed indoors, which will allow better humidity and temperature control. The building will be night-air controlled, pulling in cool air at night, and using the temperature differential between day and night to regulate the inside temperature. It is the most passive system we could achieve given the size of the space, and with the help of the solar panels, it will be energy self-sufficient over the course of a year. Wherever we can, we are choosing green materials and creative detailing. 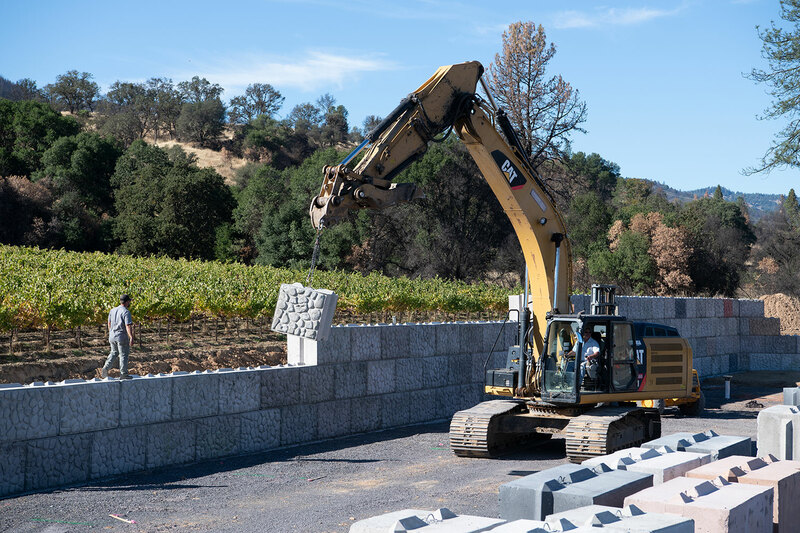 We are using NorCal Concrete recycled concrete blocks for the retaining wall that supports the ramp leading up to the crush pad. The 380 ft long wall is capped with a decorative bas-relief of iconic shapes and images from our area. Vineyard truck drivers hauling grapes will start at the bottom and see imprinted grapevines and wildflowers, then forest with mushrooms and bear, then ocean with sea creatures and a surfer. The tasting room and office floors will be made with recycled maple from the flooring of an old school gym. The doors will be fashioned from recycled redwood from water tanks. We have been able to salvage some of the wood from trees lost in the fire, and although it isn’t strong enough for structural lumber, we will be able to integrate it in trim work and decorative pieces. 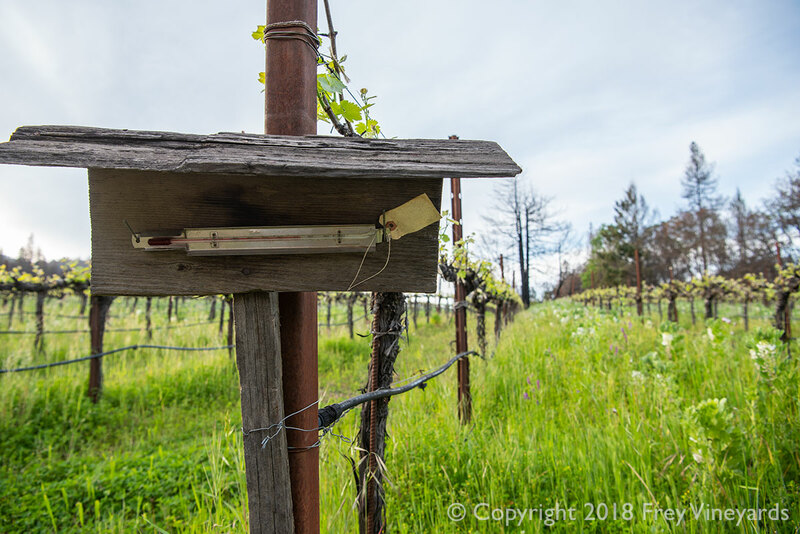 Tasting room visitors will have the added treat of a self-guided nature trail through beautiful pollinator gardens, up the benchland to survey the vineyards from above, and down along the bio-swale and the pond habitat. Our construction crew has been phenomenal in providing excellent skills and dedicated labor. Johnny Frey, our third-generation assistant winemaker, has been Craig’s main assistant with designing and building. “I often call up Katrina and tell her how amazing her son is,” Craig confesses. “We work really well together and we’re able to achieve a lot in a short amount of time.” In addition to Craig and Johnny, we’ve had the pleasure of working with owners of local companies: Ryan Mayfield of R and M Construction, Josh Smith of Smith Concrete, and Chris Solomon of Solomon Electric. 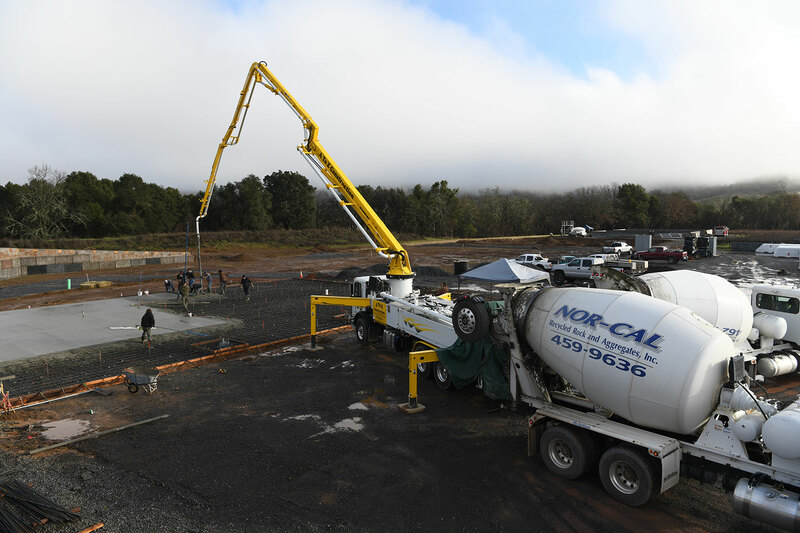 The wet winter here in Redwood Valley is great for grapevines, but not as easy on construction, so our concrete pours have been delayed. We are on schedule to have the crush pad ready in time for harvest 2019, and we’re planning on celebrating with a big party. We’ll keep you updated on our grand opening date, and we can’t wait to share our new space with you! In 2015 we set up an automatic camera in protected forestland near our organic vineyards to learn more about the local wildlife. The camera was placed at a spring high up the mountain. What a surprise it was to discover that so many animals visited to bathe and drink, including bears, foxes, deer, and many species of birds. 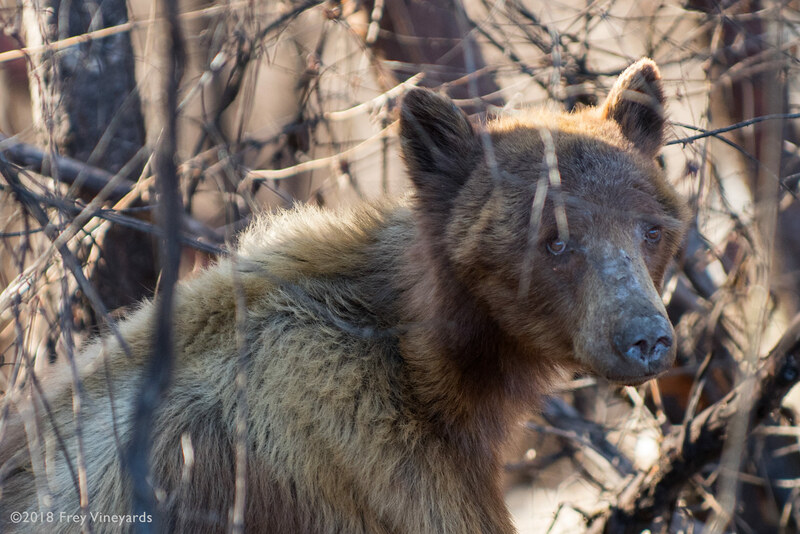 The abundance of bears was especially surprising, as the shy and elusive creature is rarely spotted in person. Another surprise was footage of a fisher (Pekania pennanti), a sleek and cat-like member of the weasel family, widespread in Canada. 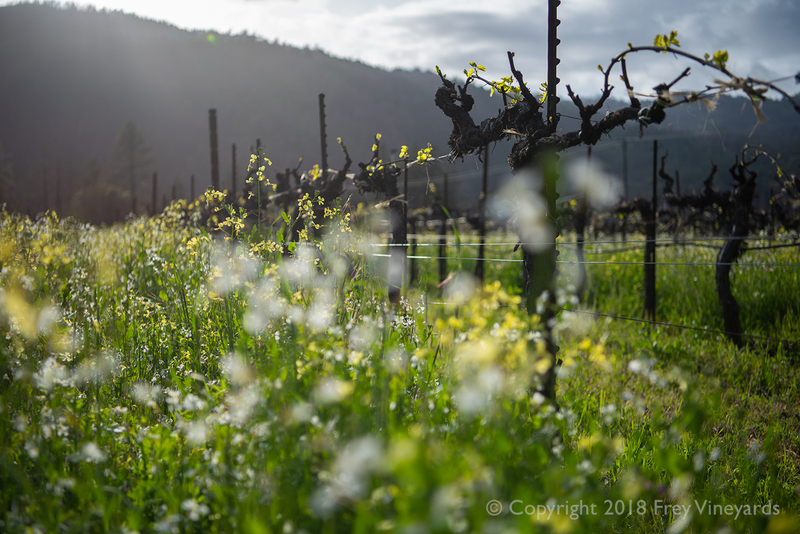 A narrow branch of their territory reaches southward to the northern Rocky Mountains, the Cascade Range in Oregon, the High Sierras, and amazingly along the Northern Coast Range of California where Frey Vineyards is located. It’s a beautiful creature that needs forestland to survive. In 2016 we added a second camera at a bear wallow about a half mile from the first camera. Familiar faces appeared such as one particularly large, tranquil behemoth of a bear, as well as a wary bear always looking over his shoulder. In the following years we added a couple more cameras, most of which were lost in the great fire that swept through our area in 2017. The one that survived captured scenes of a slow-moving forest fire, which we’ll post soon. 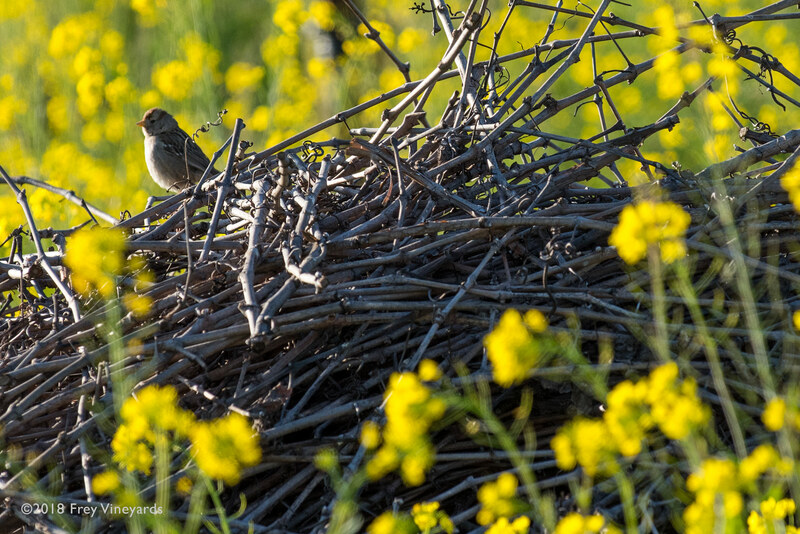 The wildlife just a short walk from our home and vineyards reminds us about the importance of farming sustainably and organically, without synthetic pesticide drift to contaminate the water and ecosystems that sustain all of us. We hope you support organic food production by choosing organic when you can. Check out our YouTube channel for the short versions. A quick video update on the progress of our new winery. May 31st It was five AM, the night after the full moon. Still brilliant, the moon was about to set in the west, just before dawn. 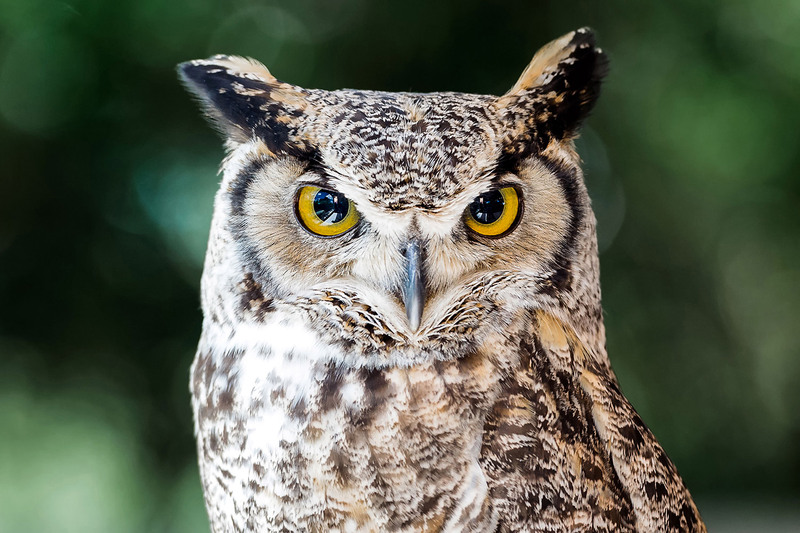 I was awakened with a blast of sound, “Hoo, hoo, hoo dat” answered by a more distant “Hoo, hoo, hoo dat.” Convinced that a huge owl was just outside our trailer, I crept out into the pearly landscape. I stood in the meadow and got my bearings, then realized the owls must be at least 150 yards away in the burnt forest by the pond. The skeletal ponderosa pines still tower and the great horned owls were perched on them, calling back and forth. These owls, also called cat owls because of their perky ears, are the apex predators, able to pounce on prey as large as rabbits, possums and porcupines. I imagined that their hunting must be eased after the fire, with no needled or leafy branches to block their view. The calling went on for another ten minutes and then I guessed they found their prey, then each other, and bedded down for the dawning day. 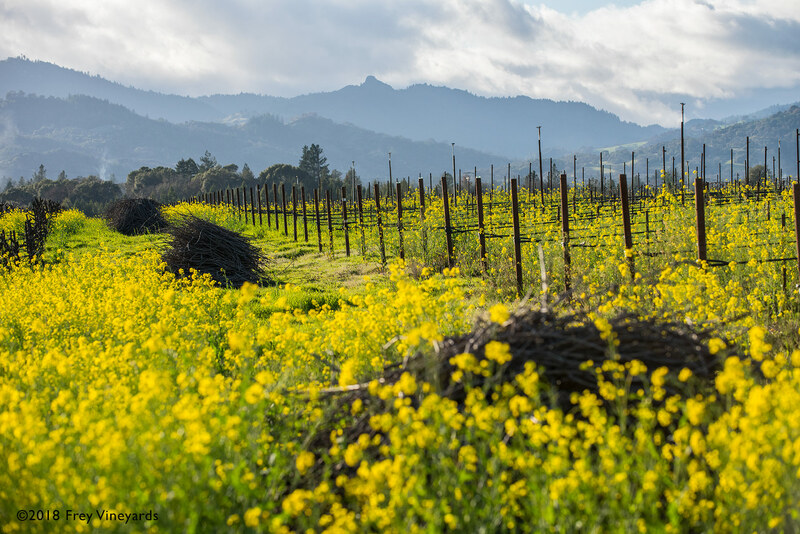 We had a mild spring, which makes life pleasant for farmers and grapevines. Cover crops grew thick and luscious; the cool weather allowed them to build a lot of biomass before flowering. As they are incorporated into the soil they add rich organic matter. Mild weather is also good for the flowering of the vines. Grape flowers are very delicate and extreme weather in either direction can affect the vines’ ability to set a good crop of fruit. Grape flowers are also very fragrant, an ambrosia of delight! Sweet, almost tropical scents of grape flowers have been wafting through the fields. Most varieties now have set clusters but the Cabernet is taking its time and looks to be setting a good crop. 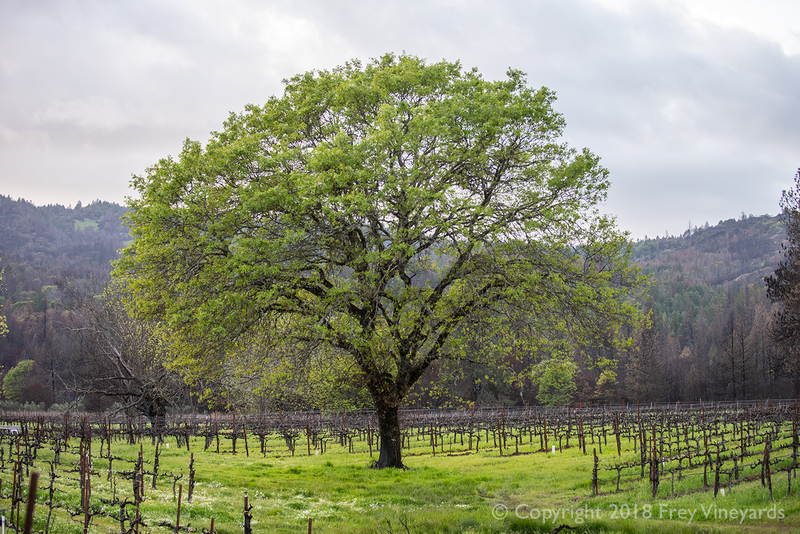 The rains this season were late and far apart which made for good vineyard working conditions throughout the winter and early spring, with fields not too wet and muddy. Frost season was also mild this year, so workers got enough rest to work through the days. This allowed the vineyard crew to get a head start on cultivation and weed control and to stay on schedule despite extra work on fencing, irrigation and frost systems that needed repair after the fires last fall. A new frost pump was installed at the Easterbrook vineyard and as summer heats up work is underway to replace destroyed drip and filters. Until bud break this spring it was hard to tell exactly how many vines had burned last fall. Now that leaves and shoots are out we finalized our dead-vine count at around 7 acres. Vines that didn’t die are doing fine with expected vigor and timing. We will be working on replacing dead vines as the season progresses. Ground is being prepared for new plantings of Cabernet and Chardonnay at our Road D vineyard. There are many steps to be completed before the young vines can be put into the ground. Soil is ripped and disked, then smoothed. Next, the irrigation system is laid out for both summer watering (to help the young vines) and spring frost protection. The grid of the vineyard is laid out by hand using cables marked with spacers, then stakes are set. Wires are installed to hang the drip hose and train the young vines as they reach their established height. Finally, the watering system is completed and the vines can be planted. After they are established it will be 3 years before any grapes are harvested. During their productive life they need much less watering. Chardonnay for this planting will be grown from cuttings made this winter. Cuttings are a form of vegetative propagation, a technique used by humankind to cultivate grapes for thousands of years. While the vines are dormant, healthy wood that grew the previous season is selected and cut to about 18”. The pieces are chosen based on girth, vigor of the parent plant and bud spacing. Two buds are left at the tip of each cutting and the rest are removed, which encourages the cutting to root at the bottom. These cuttings are bundled and buried in moist sand. These vines will be on their “own roots” as opposed to being grafted onto a rootstock. 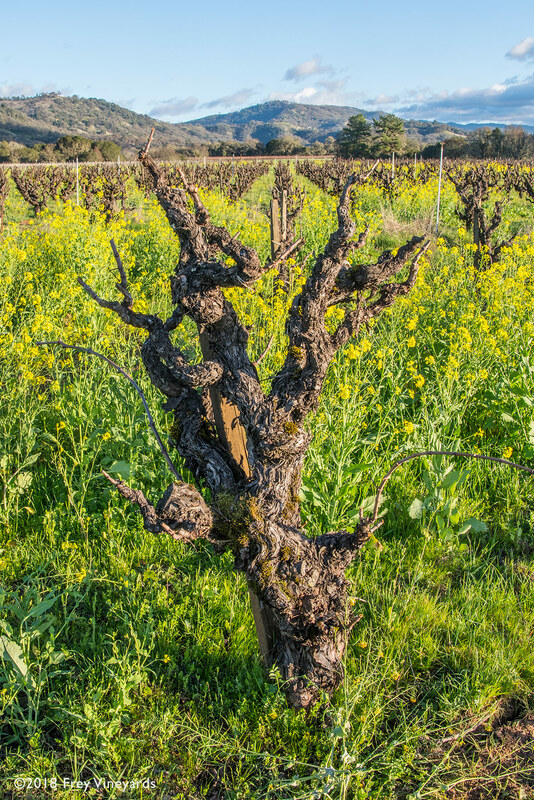 Own-rooted vineyards are uncommon due to the risk of damage by pheloxera, a soil-borne louse that can kill grapevines when populations in the soil are out of balance. We don’t worry about this in our organic soils as we have plenty of healthy soil microbiology that will compete with phyloxera and keep it from causing damage. We will begin planting soon. The cuttings were stored in a cool dark place for the last several months and are now pushing roots and shoots, eager to get planted. As springtime rolls into summertime, we are busy! We are looking forward to a summer of good ripening weather and a harvest without the challenges of smoky grapes and disruption form natural disasters. Keep your fingers crossed for us. Cheers from the crew! Here are some more photos from Spring, 2018. 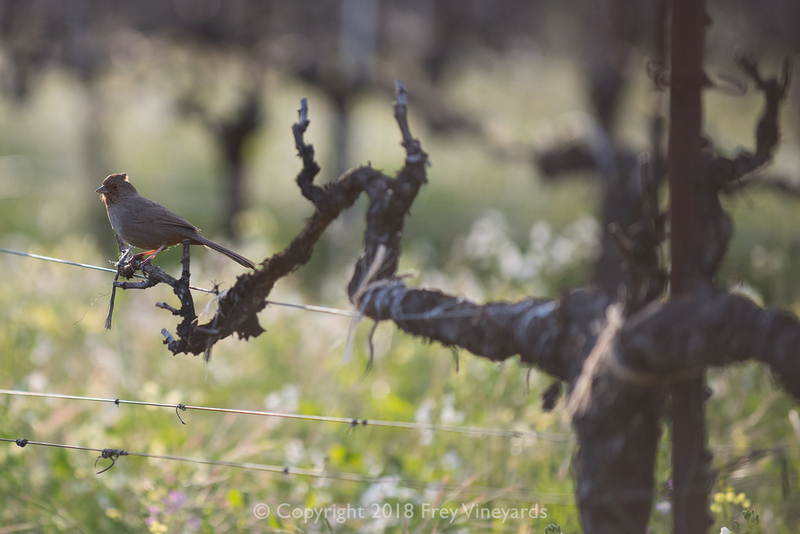 Bird resting on organic Chardonnay vine. Thermometer used during late-night vineyard frost patrol. This oak tree makes a good perch for birds that hunt insects in the vineyards. 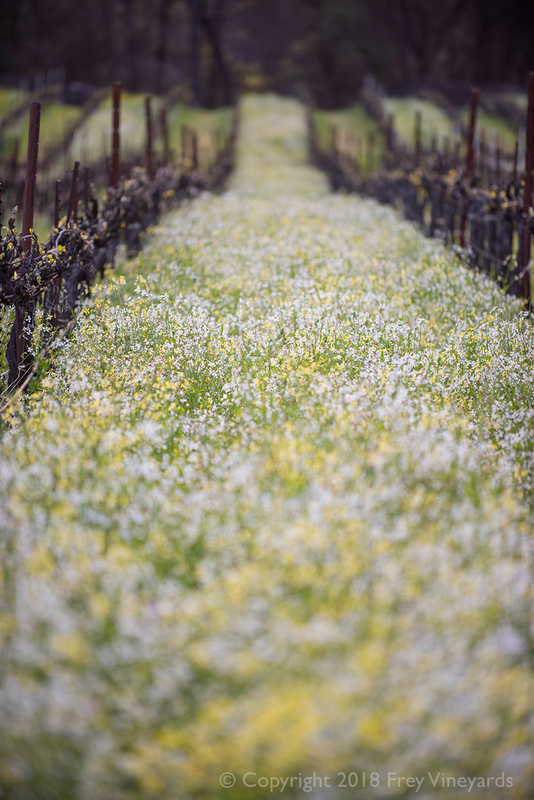 The arrival of spring has brought fresh cover crops between the rows of our organic vineyards, and is enjoyed by local wildlife on occasion. Each photo can be downloaded in higher resolution for use as your computer's desktop or wallpaper. We hope you enjoy! 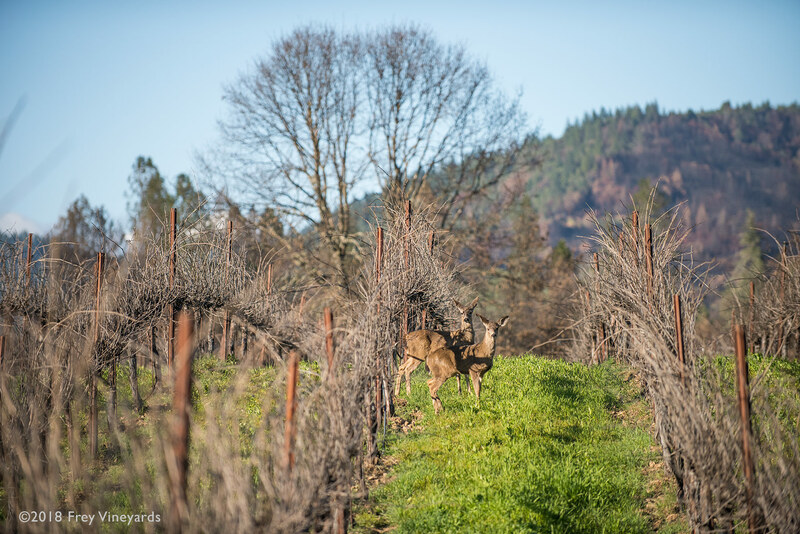 Deer graze in our Pinot Noir vineyard. Fire scars are visible on the background mountainside. Mustard growing in Redwood Valley vineyard. Local landmark of Eagle Peak in the distance. 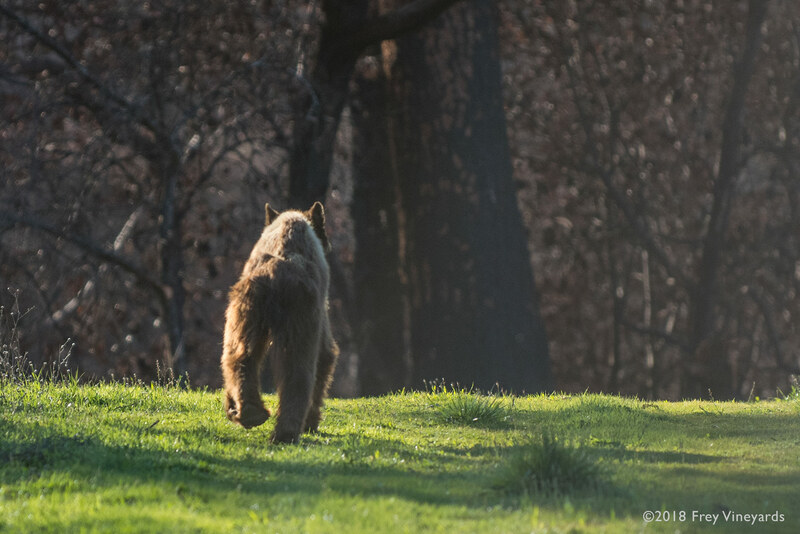 Last month a bear was spotted almost daily for a few weeks as it grazed fresh grass in our organic vineyards. Normally they shun the lowlands of our valley with its dogs and people, preferring the high forests nearby. 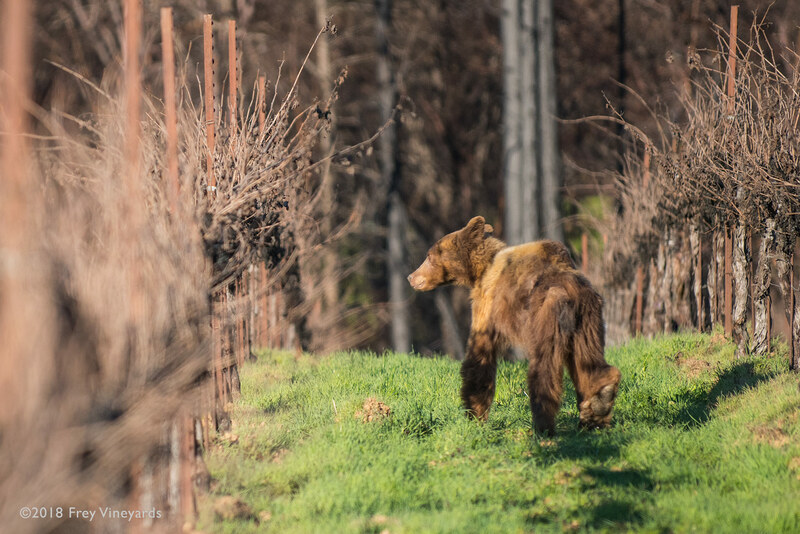 But in the aftermath of the Redwood Valley Fire last November, which wiped out whole communities near our vineyards, this old American black bear (they also come in cinnamon brown) was keen to explore newly opened territory, and perhaps driven by hunger as well. It has since moved on. Click on a photo for a larger, screensaver image. 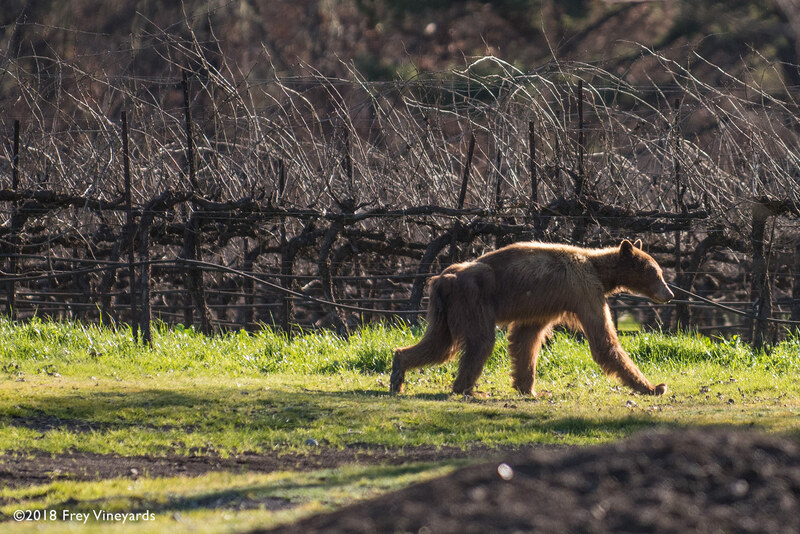 An old bear grazing in our organic Merlot vineyard last February, Redwood Valley, California. Here at Frey Vineyards we are longtime eclipse-chasers. Our penchant for gazing upward was instilled at an early age by Paul Frey Sr. Two of his twelve children, Jonathan and Paul Frey, studied physics and astrophysics at University of California Santa Cruz and went on to become winemakers for the winery. Jonathan and his wife Katrina traveled with brother Nathan Frey to Baja in 1990 to see their first total solar eclipse. At high noon, as the sky began to darken, they stood on a hillside looking down at a Mexican family farm. Chickens flew up to their roosts in the trees and the cows turned around and headed to their beds in the barn and the glory of the eclipse began. Katrina and Jonathan’s most recent eclipse trip was on a Sky and Telescope cruise to Indonesia to see the 2016 solar eclipse over the Indian Ocean. On board they met Polly White and Michael Zeiler of The Great American Eclipse, who were getting fellow travelers excited about the August 21st, 2017 eclipse that will streak coast to coast across North America. One day on the deck of the ship, Polly and Katrina hatched a plan to craft an exclusive wine to honor this extraordinary event. What started out as just one wine quickly become three when the opportunity arose to debut Frey Vineyard’s first-ever organic non-sulfited sparkling wine. On a previous eclipse journey to Mongolia in 2008 Katrina and Jonathan met fellow eclipse-chaser Dr. Lobster. We called upon him for inspiration for the back label texts. Frey label designer Nicole Paisley Martensen culled vintage engravings from old astronomy books, and furthered her research with excellent resources from eclipse authority Fred Espenak. We are proud to bring you Umbra Organic Zinfandel, Umbra Organic Chardonnay, and Totality, our first organic sparkling wine. We’re looking forward to toasting the cosmos on August 21st! “Umbra” is the dark inner shadow of the moon. “Totality” is the period of a solar eclipse when the moon completely covers the sun. For more information on the best places to view the August 21st, 2017 eclipse and to order eclipse-viewing glasses that make it safe for viewing the partial phases of this grand spectacle, log on to The Great American Eclipse. We had to share with you "The Soil Story," a great video made from the people at Kiss the Soil. Learn how regenerative agriculture and farming play an important role in reducing carbon in the atmosphere. Charbono is a grape with a labyrinthine past. Some say it originated in Northwest Italy as the grape Bonarda, and that it closely resembles the varietal Dolcetto in flavor and growing profile. More likely it came from the Savoie region of Eastern France where it is known as Charbonneau, or Doux Noir (“soft black”). In the early 19th Century it was the most widely grown red wine grape in France. It also shows up in the historical record as an Etruscan grape, planted nearly 3,000 years ago. Luckily, it was exported to South America where it continues to thrive in pockets of Argentina, before it was all but wiped out in the Old World by phylloxera in the mid-1800's. Yet for having such a long track record, it is now considered a rare bird, and there is very little of it planted in California today, hovering around 80 acres. Charbono arrived in Calistoga in the 1880’s at Inglenook Winery, where it remained in production straight through Prohibition as a sacramental wine. It is very late ripening, which can require extra hang time in the vineyard, and puts it in danger of early fall rains that can produce mildew within the tight clusters. The fruit is paricularly slow to reach adequate sugar levels and is often picked at 22-23 brix. However, the longer hang time does allow for the development of mature flavors, even as sugars stay low. In the U.S., Charbono is considered one of the first cult wines, in part because of its exotic heritage, and also due to its unique flavor profile. Charbono displays a wide range of flavors that can often include kola nut, vanilla bean, cassis, violets, and tar all in one. 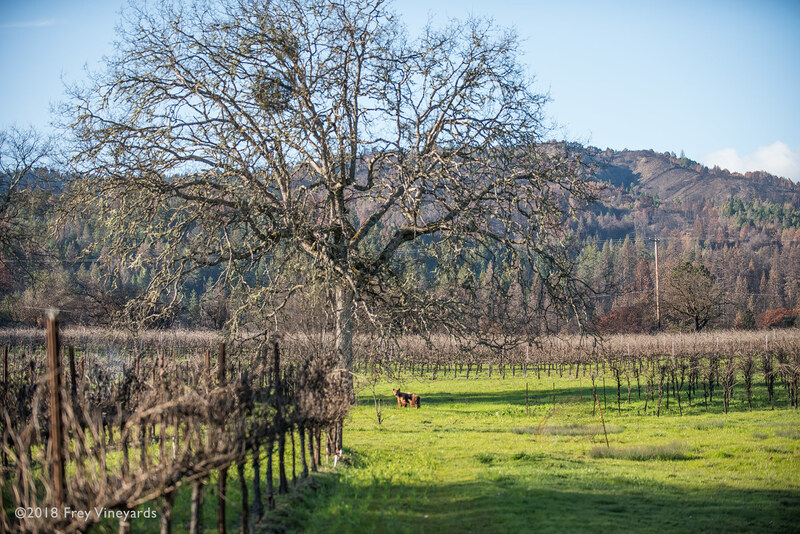 Although a huge proponent of the unusual grape, Randall Grahm of Bonny Doon Vineyard declares Charbono to be “terminally rustic” because of its bold and uncompromising flavors. In the glass, it is traditionally a deep, inky, purple color and was used most often as a blending grape until it caught on more recently as a single-source varietal. 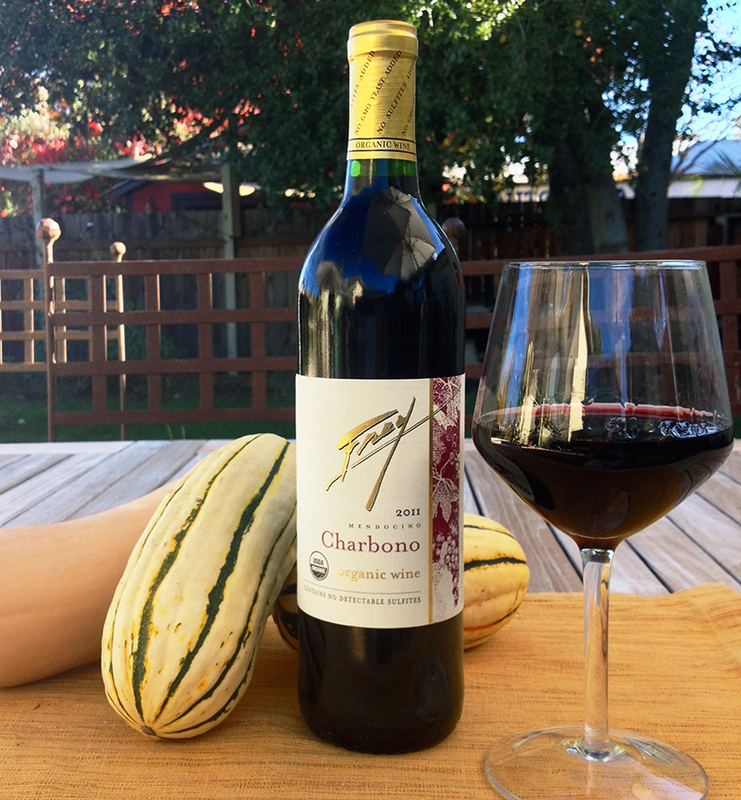 Our 2011 Organic Charbono comes from 3rd generation grape grower Eddie Graziano in Calpella in Mendocino County. The grapes are from two different blocks, one with old vines planted by Eddie’s grandfather, and the other with 12-15 year-old vines. Our Charbono has aromas of wild berry and oak barrel. On the palate, it is gentle and broad without being heavy. Supple damson plum merges with lengthy opulent tannins. Because of the higher acidity and lower alcohol it can cellar longer than some of our lighter-bodied reds. This would be a fantastic pairing with mustard seed-encrusted roast venison or purée of chestnut soup. This limited release is available in our wine shop.